This is a point map of the Megalodicopia Hians. These animals are often found off the cost of the Monterey Bay. Predatory tunicates receive their name from their jellylike "tunic" and resemble a Venus Fly Trap in appearance. The Predatory tunicate’s name originates from its outer tunic, a protective covering against predators. This tunic is made up of material similar to that of cellulose and has a thin inner lining called the epidermis, which secretes the tunic. Inside the epidermis lies a layer of dermis that is thicker and often called the body wall. This body wall has many muscles which contract and force water and other wastes to jet out of the exhalent siphon, thus giving the Predatory tunicate, along with most other tunicates, the name “sea squirts”. 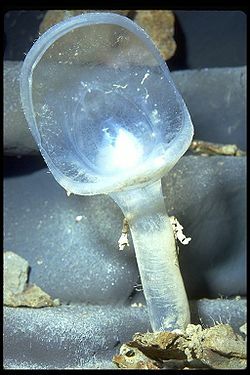 This tunicate is also unique in the fact that it is a simultaneous hermaphrodite, meaning it alone can produce both egg and sperm. Though it has this capability, the Predatory tunicate tends to do this only when conditions are poor or there are no other tunicates around. More often than not, the eggs and sperm will mature at different rates in order to decrease the chance of self-fertilization. Fertilization occurs when one Predatory tunicate releases sperm and it is carried into the incurrent siphon of a neighboring tunicate and fertilizes the eggs inside. When the Predatory tunicate is in its larval stage, it has a tadpole-looking appearance and an odd flexible backbone called a notochord. Along with this notochord, it possesses a nerve that spans down its relatively lengthy tail. This tale is strong and is used to propel the Predatory tunicate along while it is still in its egg form. The Predatory tunicate also possesses the ability to sense light and gravity, which it mainly uses when finding a place for metamorphosis when it is young. Like all animals, the Predatory tunicate goes through many stages of life. Beginning inside the egg, the Predatory tunicate lives inside a larger tunicate. This egg does not eat, but instead its entire mission is to find a new place to live other than inside its mother. 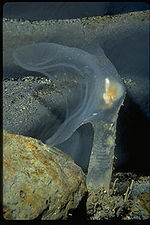 In the larva form, the Predatory tunicate is microscopic and short-lived. During the larval stage the tunicate lives on the nutrients still left over in the yolk sack. Using its strong tail, it propels itself along in search of a place to undergo metamorphosis. It also uses its light and gravity-sensing features to find a good location. Once the Predatory tunicate finds its spot, it lands with its cephalic (head) side down. This is a point map of the Megalodicopia hians. The Predatory tunicate is unlike most tunicates as it is very much like a cross between a jellyfish and a Venus Fly Trap in appearance. This aggressive predator clamps down its hooded mouth as soon as small creatures unknowingly swim inside. ↑ Sanamyan, Karen Megalodicopia-Hians-1918 Acidiacea-World-Database. Web. Date-of-last-update-2007-12-05. ↑ 2.0 2.1 2.2 Sophia. Underwater Fact 103 "Aqua-Marine-Life. Web. Date-of-publication November-11th-2012. ↑ 3.0 3.1 3.2 3.3 3.4 3.5 3.6 Tunicates Marine Education Society of Australasia. Web. last-updated 2011. ↑ Farren. Phylum-Chordata Slide-Serve. Web. ↑ Merritt, Allison. Academics. Web. ↑ Predatory-Tunicate Monterey-Bay-Aquariun. Web. Date-of-last-update 2012. ↑ Sookietex Nanoscale-whiskers-from-tunicates,-commonly-known-as-seas-suirts,-could-grow-human-muscle-tissue Nanotechnology-Today. Web. Date-of-publication Saturday-March-26-2011. ↑ KL Jr, Rinehart. Antiviral-and-Antitumor-Compounds-From-Tunicates US-National-Library-of-Medicine-National-Institutes-of-Health. Web. Date-of-publication Janurary-1983. ↑ Sims, Calvin. From-Depths-of-Obscurity,-Aquarium’s-New-Stars The-New-York-Times. Web. Date-of-publication December-22-1998. ↑ Sophia. [http://aqua-marine-life.com/underwater-fact-103/ Underwater-Fact-103] "Aqua-Marine-Life. Web. Date-of-publication November-11th-2012. ↑ Sookietex. Nanoscale-whiskers-from-tunicates,-commonly-known-as-seas-suirts,-could-grow-human-muscle-tissue Nanotechnology-Today. Web. Date-of-publication Saturday-March-26-2011. ↑ KL Jr, Rinehart. [Antiviral-and-Antitumor-Compounds-From-Tunicates US-National-Library-of-Medicine-National-Institutes-of-Health. Web. Date-of-publication Janurary-1983. This page was last modified on 7 January 2016, at 14:50.